1 In the city of Florence, there is a beautiful church. Its dome can be seen from all over the city. The dome itself is huge, bigger that the dome of the United States Capitol. Eight white ribs divide its rusty orange-colored bricks into eight sections. On top of the dome is a shining copper sphere; on top of that is a cross. 2 This is the church of Santa Maria del Fiore, a cathedral begun in the 1200s. Two hundred years later, the main construction of the cathedral was almost finished. The cathedral only needed a dome to cover its main section, and it would be complete. Constructing the dome, however, would not be an easy task. No one since ancient Roman times had built such a dome. Medieval methods of construction, using flying buttresses outside of the building to support its weight, were no longer popular. A beautiful, self-supporting dome was needed to complete this Florentine masterpiece. 3 Soon, a competition began to find the architect who could create such a dome. Filippo Brunelleschi and his rival Lorenzo Ghiberti were the top two contenders. Ghiberti had already bested Brunelleschi once before in a design contest. Brunelleschi did not want to come in second again. 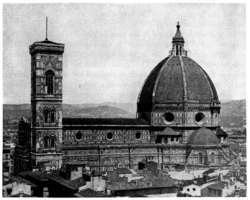 Brunelleschi's design did win, and construction on the dome began in 1420.